This article appeared in Fermilab Today on Sept. 5, 2014. 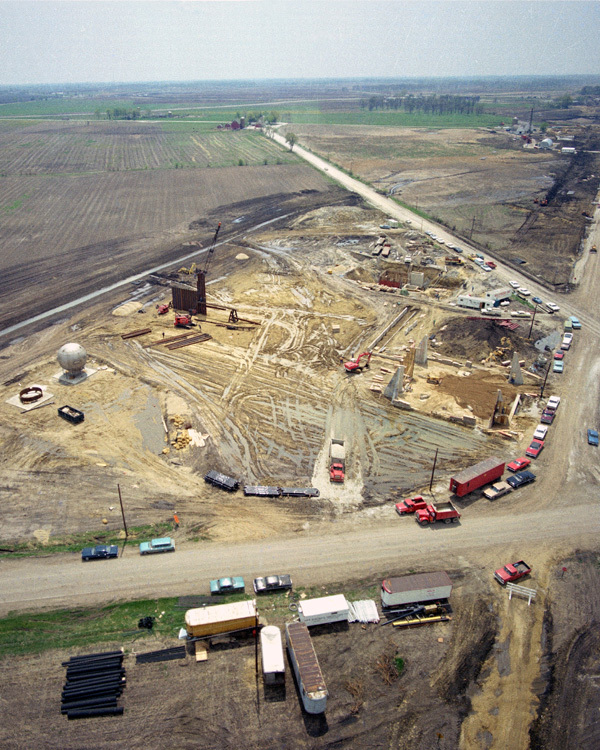 It was called Target Station C. One of three stations north of Wilson Hall at the end of beamlines extending from the Main Ring (later replaced by the Tevatron), Target Station C was assigned to experiments that would require high beam intensities for investigating neutrino interactions, according to a 1968 design report. Within a few years, Target Station C was officially renamed the Neutrino Area. It was the first named fixed-target area and the first to be fully operational. 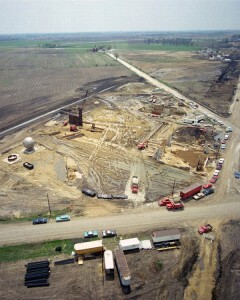 Neutrinos and the Intensity Frontier had an early relationship with Fermilab. But why is it resurfacing now? “The experimental program is driven by the current state of knowledge, and that’s always changing,” said Jeffrey Appel, a retired Fermilab physicist and assistant laboratory director who started research at the lab in 1972. When Appel first arrived, there was intense interest in neutrinos because the weak force was poorly understood, and neutral currents were still a controversial idea. Fermilab joined forces with many institutions both in and outside the United States, and throughout the 1970s and early 1980s, neutrinos generated from protons in the Main Ring crashed through a 15-foot bubble chamber filled with super-heated liquid hydrogen. Other experiments running in parallel recorded neutrino interactions in iron and scintillator. It turns out that the W and Z bosons are too massive to have been produced this way and had to wait to be discovered at colliding-beam experiments. As soon as the Tevatron was ready for colliding beams in 1985, the transition began at Fermilab from fixed-target areas to high-energy particle colliding. Although neutrino research was a smaller fraction of the lab’s program during Tevatron operations, it was far from dormant. Two great accomplishments in neutrino research occurred in this time period: One was the most precise neutrino measurement of the strength of the weak interaction by the NuTeV experiment. The other was when the DONUT experiment achieved its goal of making the first direct observation of the tau neutrino in 2000. In partnership with institutions around the globe, Fermilab began planning and building a suite of neutrino experiments. MiniBooNE and MINOS started running in the early 2000s and MINERvA started in 2010. MicroBooNE and NOvA are starting their runs this year. Now the lab is working with other institutions to establish a Long-Baseline Neutrino Facility at the laboratory and advance its short-baseline neutrino research program. As Fermilab strengthens its international partnerships in all its neutrino experiments, it is also working to position itself as the home of the world’s forefront neutrino research. “The combination of the completion of the Tevatron program and the new questions about neutrinos means that it’s an opportune time to redefine the focus of Fermilab,” Appel explained. Special thanks go to Fermilab archivists Valerie Higgins and Adrienne Kolb for helping navigate Fermilab’s many resources on early neutrino research at the laboratory.